We are firm believers in, and practice the tenets of, many mantras about keeping the outdoor recreation areas we use clean and preserved for future visitors and generations. Sayings like “Pack It In, Pack It Out,” “Leave No Trace,” “Take Only Pictures, Leave Only Footprints” and, essentially “Leave It Better Than You Found It” all have their audiences and those who carefully follow and practice them. Of all those people though we are wondering how many actually go so far as to consider the chemicals they leave behind in the environment from washing dishes or even themselves for that matter. We are guessing most of our readers have heard the term biodegradable before. A product, material or compound that is biodegradable will eventually be broken down and reduced to its constituent parts by the actions of bacteria, fungi, or other biological means. I used to think that “biodegradable” also include the actions of Infrared (IR) or Ultraviolet (UV) light but those are, in fact, categorized under the umbrellas of Photodegradation (UV) or Thermal Degradation (IR) and a topic for a future post…maybe. Actually probably not. 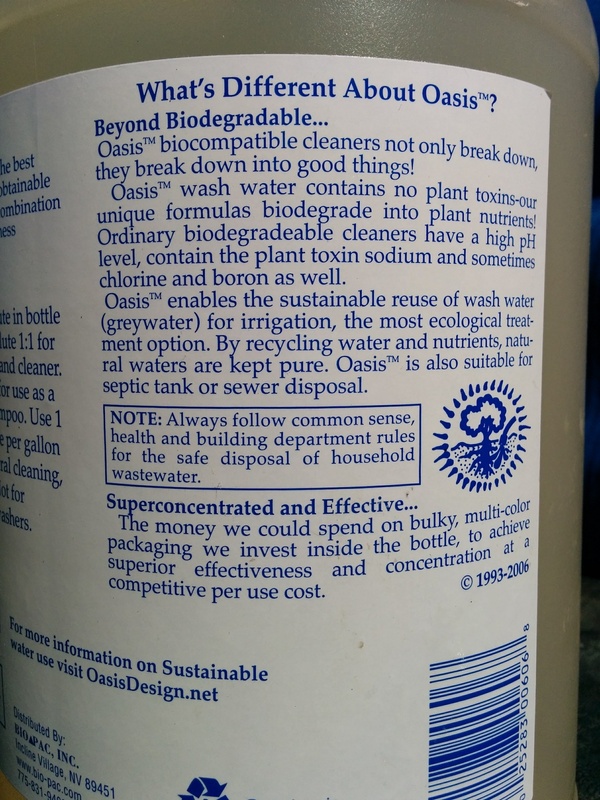 Choosing to use products that are biodegradable is a good first step but a manufacturer’s claim of a product being biodegradable is under-regulated and open to corporate interpretation much like the term “Natural.” The term only means that those broken down compounds are, supposedly, not harmful to the environment and does not necessarily mean that those compounds are good for the environment. “Biocompatible” products take this promise one step further though and when they biodegrade they actually break down into compounds that are beneficial; plant food if you will. 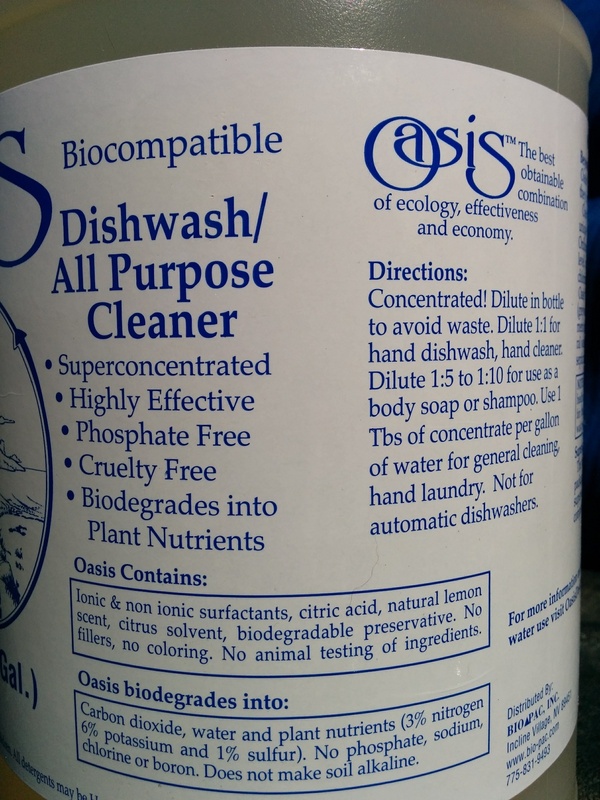 About six months ago when we were finishing up the last small bottle of Seventh Generation Natural Dish soap we were using we decided to see what was available in the biocompatible realm and soon came across Oasis Biocompatible Dishwash/All Purpose Cleaner. Right now we are using it diluted 1:1 for hand soap and dish washing. As soon as the last of our laundry soap and shampoo are finished we’ll do the 1:5 dilution in another bottle and see how this works for those purposes as well. It has a nice, clean, light citrus scent. This is the polar opposite of those nasty, Lavender (or other) scented products (which means they use some chemical you cannot pronounce to hijack your olfactory sense and make your brain think it smells something kinda-sorta like lavender or whatever Tide or All or whoever wants you to smell). Ick. The Amazon listing mentions, inexplicably, that this “Tastes Great” and that it is a “Great Gift Idea.” We agree with the second but have no intention of testing out the first hypothesis. So far this cleans as well as any other product we have used in the past and actually seems to rinse off more thoroughly than some of the more commercial name-brand products. It certainly smells better than many of them while we’re actively using it but does not leave a residual smell on our dishes or hands after they have dried which is a nice bonus for those like us who are not a fan of artificial scents and colors. Since it is so concentrated we will make up a batch in a smaller bottle for our next excursion and leave the bulky gallon container at home which is another plus when our available space is limited and the less weight we need to carry around the better. When we’re situated in the depths of some beautiful back country spot we now have no qualms parceling out our rinse water at the base of several select trees and plants. What we are hoping to see is that next time we make use of one of these campsites we’ll notice that the plants we gave the biocompatible gift to might look a bit healthier than their un-gifted neighbors. We will let you know what we find. When we bought our gallon from Amazon a couple of years ago it was $40+ and then it went out of stock…for well over a year. We recently looked again and found it is back in stock with the price reduced by a little less than half and are happy to link to it again for all your cleaning needs. 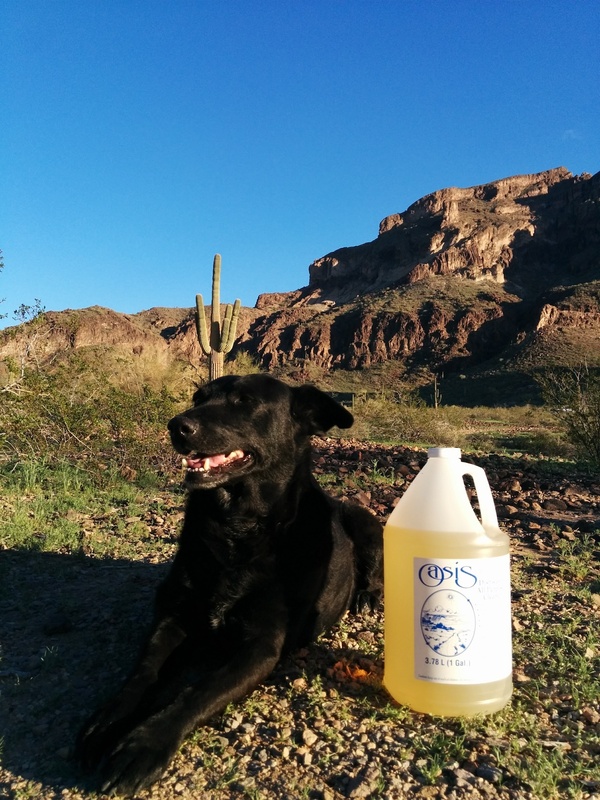 The next time you and your family, be it human, canine, feline (or other) are out enjoying our beautiful natural areas you might want to take the next positive step to minimize your footprint and would do well to consider using either (or both) of these products. If you do give them a try please feel free to come back here and let us and our other readers know what you think about them. Works fine for handwashing dishes, along with the counter and sink. Doesn’t make me sneeze like most other soaps do. Lots of suds – even when diluted as directed. I’ll be trying it as shampoo as soon as my current bottle runs out. The original link in the post used to work but then eventually that seller on Amazon ran out so the listing said out of stock and it has been that way for over a year now. I went back into Amazon, searched for Oasis again and found several sellers with it in stock and changed the link in the post to point towards those. Thank you for the update. over. Amazon no longer carries it. So, when my gallon bottle eventually runs out I will start asking health food stores or places like GNC if they have it or will they carry it.